I don’t know which I like better, the sauce that materializes while cooking the clams or the clams themselves. Be sure to have on hand plenty of grilled or fresh bread to dip into the broth. This is equally good with fresh mussels. In a large sauté pan heat the olive oil. Add the shallot and red pepper flakes and sauté until the shallot is softened and turning golden on the edges. Stir in the garlic, then the tomatoes, and cook until the tomatoes begin to break down. Add the white wine, bring to a simmer, then crumple in the saffron. Add clams and cover the pan with a lid. Cook until the clams begin to open. Do not overcook; if necessary remove open-shelled clams to a plate and continue to simmer until the remaining clams open. Discard any clams that do not open. Stir butter into sauce and season to taste with salt and pepper. 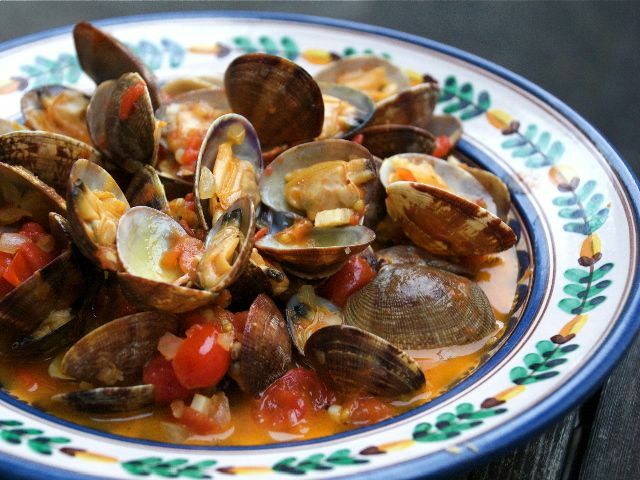 Spoon clams into a shallow bowl and top with the tomato-saffron sauce. Serve immediately.